This week's super sweet shop is Little Snuggle Bunny. 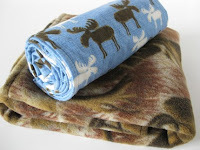 Shelly makes these amazing, luxurious blankets by hand. I'm in love with her sophisticated fabric choices, definitely something for a chic mommy. I've found that this is a trend lately. More and more moms are looking for items in fashionable fabrics and prints. I know, personally, that this appeals to me. As much as I like a very "baby-like" item ON my child, if I have to carry it around I like for it to be something that appeals to me too. And Shelly has that covered. From her soft cuddly minky blankets to her funky fleece blankets, there's just something for everyone. The best thing about her though is that she puts so much love into each blanket like she is "making it for my own son." This week's prize is AMAZING!! 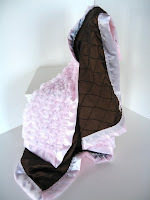 Shelly is offering up the gorgeous pink and brown blanket. It's so pretty! I love it! It's retail value is $65! Holy smokes, that's so generous! (I really do have the BEST giveaways!) All you have to do is go to the Little Snuggle Bunny Shop, find any item to be inspired by, and make a creation (any creation you want.) Post a link to your creation right here on this post and you'll be entered in a Random.Brady drawing to win this amazing blanket! Here is my card for this week. It is based on the Little Jungle Baby blanket. I just love it! Brady's nursery was done in a jungle theme and we're bringing back the stuff for our new baby boy! 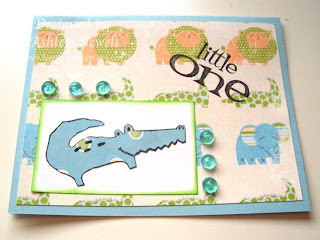 Of course, I had to make a baby boy card to celebrate my big announcement yesterday. 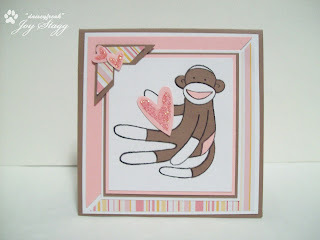 Here is Joy's darling monkey card. I love the glitter and of course the color combo. Lee's gorgeous snowflake card. 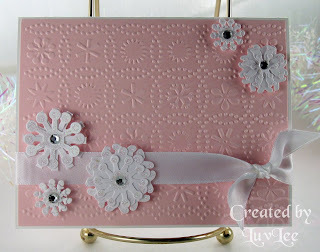 I love the pink embossing and all those fabulous snowflakes! Here's Tiff's super fun card. I love all the textures and dimension! This week, we say goodbye to Christine. Thank you so much Christine! We've LOVED your layouts this month, they are all fantastic! And this one is NO exception! 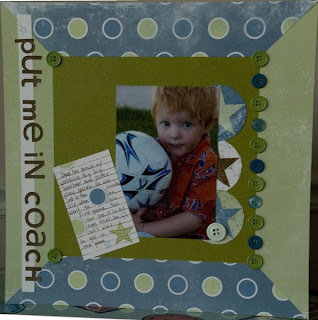 I love the fun edging and the wonderful embellishing. Also, that picture just melts my heart. Thanks Christine for an awesome January! OH I always LOVE seeing the different takes on the inspiration!!! Such beauty!!! Bye Christine!! You are amazing!! Here's my card. I love your challenges Ashley! Hmm..I did post my creation..but it seems its been deleted..:( oh well..thanks for the nice comment anyhow! What a wonderful sampling of projects. All so pretty! Great samples as always from the DT. I'm planning on playing along alittle later in the day. Need to fix a project from last night first. Doh! Fun stuff this week Ash! Love your choice this week - what an adorable blanket that she is giving away! I finally got to play this one! Here is the link to my card. Love the inspiration this week, DT rocked it again this week! You girls ROCK!! Love the cards, and love the blankets!! I took a different kind of approach to this week's shop! Love the etsy store this week!! Here is my card for the week! !